It has been a long while since I have posted in the forums, so I thought I would post an update on what I've been doing in my spare time over the past few months or so.. When FleaFPGA Uno enquiries fell far short of the minimum needed to do another production run, I began designing a new FPGA development board. I was somewhat inspired by a product that had appeared in the marketplace around the same time as my Uno board. 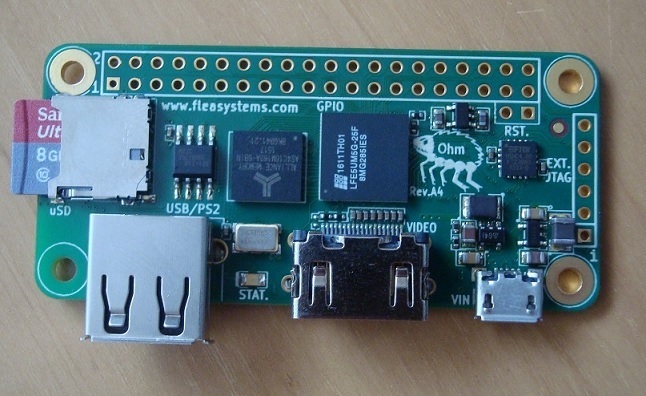 That board was the raspberry pi zero! I then decided that I wanted to do an all-FPGA variant that was compatible to the pi in terms of GPIO but with 'a few extras here and there'. I then saw Lattice Semiconductor's newest ECP5 series FPGA (and far more capable than the MachXO2) became available recently, so I thought what the hey and had a crack at it..
Long story short: I created two new FPGA prototype boards using the capable ECP5 FPGA, which I've called the "Ohm" and "Ohm+". - ECP5 FPGA 24K LUT 112KB BRAM. - 32MB 16-bit wide SDRAM (or 128MB LPDDR for Ohm+). I hope to receive my final PCB prototypes within the next two weeks or so.. More to follow - thanks for reading! Hey Valentin, very cool fpga board! Very cute! Is possible to run Atari 800XL or other cores on it? Ohm is beautiful!!! I love small boards.